The event is one of it’s kind collection of like-minded people – start-ups, aspiring entrepreneurs, Venture Capitalists & government officials. It is a great opportunity to attract & interact with corporates, startups & professionals. Lucknow has emerged as one of the hubs of start-up networks. We have seen entrepreneurs mushrooming from various nook and corners of Lucknow. “Entrepreneurship is the capacity and willingness to develop, organize and manage a business venture along with any of its risks in order to make a profit”. Our eminent speakers will be focusing on these topics and would try to develop a basic knowledge of these requirements. The event will have VC’s and successful entrepreneurs as keynote speakers. We will be able to exchange good energy with them, as they will share some important lessons based on their life experiences or business achievements. It would be an interactive session, where keynote speakers will take A2A. 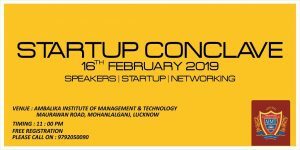 Program will consist of a panel of 4 to 5 of our prominent guests (IAS Officers, start-up mentors, start-up founders and venture capitalists). There would an individual session followed by an open interactive session with our audience. Panel discussion would be of two and half hour starting from 11:00 am to 01:30 am.